Sarah Webb will guide you through the steps to make your very own, unique round-based log basket. More accomplished makers will be able to experiment with differing weaves to create pattern and texture, and you’ll leave having learned useful techniques for future learning, or to carry on making baskets at home! Sarah is an experienced, good-humoured and patient teacher; with her careful guidance every student should be able to complete one log basket. This course is not for total beginners, previous attendance on a beginners’ basketry course at Halsway or elsewhere would be ideal. 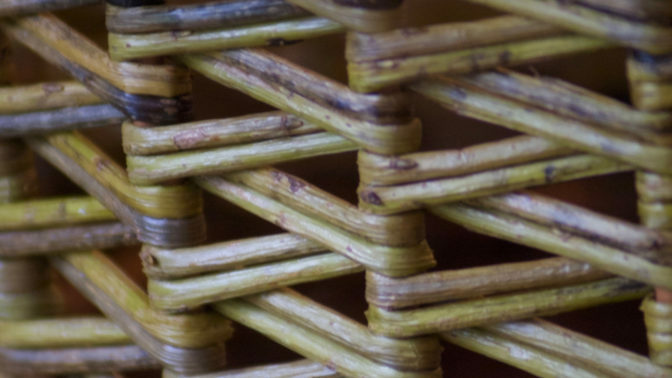 The techniques used are no more difficult than in making smaller baskets; however the materials used to made log baskets are thicker than in many other forms of basketry, so if you have weak or arthritic hands this may prove difficult for you.